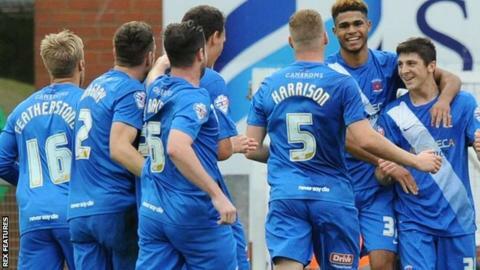 Crystal Palace loanee Jake Gray (far right) scored his first two Hartlepool goals against Leyton Orient. Hartlepool United's 3-1 League Two win against Leyton Orient on Sunday showed the benefit of loanees to the squad, says manager Ronnie Moore. Pools signed Kal Naismith and Mikael Mandron last Friday, while Crystal Palace winger Jake Gray scored twice on his league debut. Middlesbrough defender Adam Jackson also made his league bow for Pools. "It doesn't destroy the dressing room, the loan lads get on really well," Moore told BBC Tees. "The lads who miss out might be a bit upset but if they'd done it right in the first place then I wouldn't have had to get people in. Carl Magnay was the winner of the Football Icon television programme in 2007, winning a Chelsea contract. "Our dressing room is fine, no 'Billy Bigtimes' in there, and if we have then they're straight out of the door." Moore described the return of defender Carl Magnay as like "having a new player", with the former Chelsea and Gateshead player handed the captaincy on his return to the side after a six-game ban for spitting. "He did well, first 15, 20 minutes he got caught in possession a bit, getting used to the timing but after that he was a man-mountain," Moore continued. "That's why I made him captain. We know what type he is. "We knew we'd missed those tackles he gets in, but it was a great team effort."